Cook spinach as directed on package. Place in colander or strainer; rinse with cold water to cool. Squeeze spinach to remove as much moisture as possible. In food processor bowl with metal blade, combine cream cheese and chiles; process until smooth. Add spinach; process just until blended. Place 1 tortilla on work surface. Spread 1/4 of spinach mixture over tortilla, leaving 1/2-inch border on one side. Place strips of roasted pepper, piecing together if necessary, across middle of tortilla. Roll tortilla toward border, making sure beginning is tightly rolled, but easing pressure as rolling continues to avoid forcing out filling. Wrap in plastic wrap; repeat with remaining tortillas, spinach mixture and roasted peppers. Refrigerate at least 1 hour before serving. Remove plastic wrap from tortilla rolls. Cut each roll diagonally into 8 slices, trimming ends. 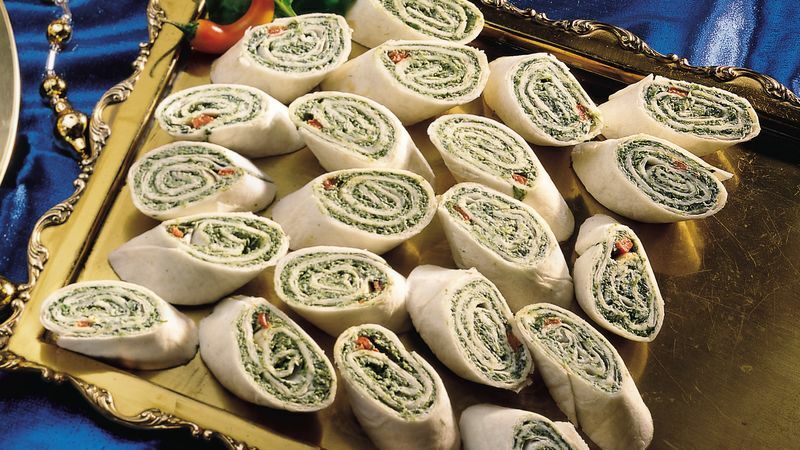 MAKE-AHEAD TIP: Roll-ups can be refrigerated up to 8 hours. Just before serving, cut into slices.